The 2017 National Jamboree has ended, and the countdown to the 2019 World Scout Jamboree has begun. The 24th World Scout Jamboree will be held at the BSA’s new permanent Jamboree home: the Summit Bechtel Reserve in West Virginia. It’s actually co-hosted by three Scout organizations: the Boy Scouts of America, Scouts Canada and Asociación de Scouts de México. Now that you’re sufficiently hyped up, your next question is probably: Great, how do I become a part of this moment in history? To find out, I talked to two young, bright members of the U.S. Contingent Management Team: Rachel Eddowes and Todd Christian. Eddowes is the co-contingent leader and Christian is the co-team leader for the contingent’s marketing team. The BSA contingent will include 10,000 people — the largest contingent the BSA has ever sent to a World Jamboree. The total will encompass Scouts/Venturers, adults and staff. Even though the BSA’s presence at the World Jamboree will be large, we’ll make up only one out of every five people at the event. That means approximately 80 percent of Jamboree attendees will be from one of more than 160 other countries planning to attend. Max number: 7,200 participants in 180 units. Each 40-person unit will have four adult leaders and 36 youth. Adult eligibility: Like for National Jamborees, prospective World Scout Jamboree leaders will fill out an application. Approval and a final decision will from the U.S. contingent leadership. Cost: To be announced, but will be similar to the cost of attending a National Scout Jamboree at SBR. The World Scout Jamboree cost will include transportation, and, to keep costs down, there will be no pre- or post-Jamboree tour. What youth will do: Cook, camp and participate in the Jamboree program with your troop or crew. That plus meet people from around the world, participate in high-adventure programs and have a true cultural experience. What adult leaders will do: Facilitate troop and crew travel, ensure the health and safety of Jamboree participants, and help the youth make the most of their experience. How to register: Keep an eye on the U.S. contingent website. Eligibility: Must be at least 18 by the first day of the World Scout Jamboree: July 22, 2019. What you’ll do: As a member of the International Service Team, you’ll work alongside Scouts and Scouters from around the world. Most jobs will be similar to the jobs available at a BSA National Scout Jamboree. How to register: Keep an eye on the U.S. contingent website. You’ll apply through the U.S. contingent and be approved by the BSA. After that, the World Scout Jamboree host team — separate from the U.S. contingent team — will make the final staffing position decisions. 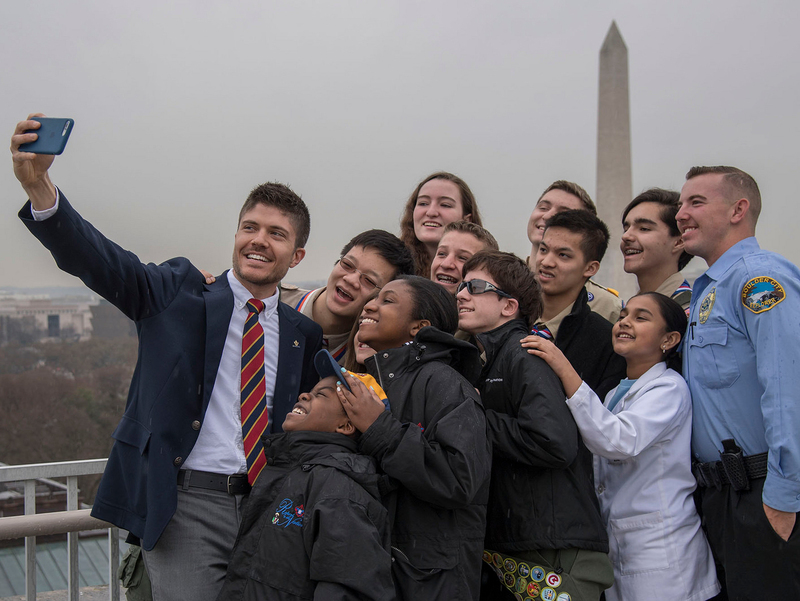 Want the latest news about the U.S. contingent for the World Scout Jamboree? Follow @wsj2019usa on Facebook, Instagram and Twitter. See the contingent’s website for more information. BSA photos by Jeff Hattrick (first three photos) and James G Parker.